All around the world Earth Day is celebrated on April 22nd to raise awareness to the importance of protecting our environment. This year, the main goal is to end plastic pollution. We send 8 million tons of plastic into the ocean every year. That’s the equivalent of dumping a garbage truck full of plastic every single minute. The trash and waste dumped into the ocean washes up on beaches and coastal areas and affects everything in between. Every marine animal is affected by man-made chemicals released in the water. We use only non-toxic biodegradable cleaning products, which are safe for our customers, their pets and the Earth. Most of our supplies are recyclable and biodegradable. We implement sustainable cleaning techniques, which help save cleaning products, energy and water. We recycle all plastic and other containers. We use a Zero Waste Box from Terra Cycle for recycling disposable gloves. We advise our customers on recycling options available in their buildings and the area. Our long-term goal is to benefit society by driving sustainability innovation across the cleaning industry. TerraCycle provides access to free national recycling programs for some hard-to-recycle items. They also sell unique Zero Waste Boxes, in which one can dispose of materials that are considered nonrecyclable like chip bags, coffee capsules, water filters, etc. Classmaids offers to our customers a unique 15% discount code for all TerraCycle products, which can be used on TerraCycle's e-commerce website. With environmental safety and protection a growing issue (& rightfully so! ), it is more important than ever to use eco-friendly products and practices wherever possible. Home cleaning is one of the best places to utilize green products, which helps to ensure not only a clean living area, but a healthy home as well. Adopting clean, sustainable living habits offers a multitude of benefits to both you and your family, and you’ll see that incorporating these habits into your daily lifestyle is not hard. Here are a few tips to help you practice sustainable cleaning. Depending on the size of the cleaning task, measure and use only the amount of water you will need. For example, wiping down appliances with a reusable cloth might require a gallon or two of water, while scrubbing the garage floor would need more. Err on the lower side and refill your bucket as needed, minimizing wasted water. Consider reusing or refreshing a pail of water that is used first for a light cleaning job, such as wiping countertops, for a second task like cleaning fan stands or book cases, etc. Minimizing your water usage can become a comfortable habit as you get used to it. While many businesses now include recycling in their commercial cleaning program, home cleaning approaches in many communities are still catching up. If your county offers containers for recycling, jump on board to begin recycling your bottles, boxes and paper products. If not, organize your recyclable products and drop them off at designated bins. When buying cleaning products, look for packaging that is recyclable, which will help to further your sustainable cleaning efforts. More green products are appearing on store shelves every year. And when considering a specific cleaning service, check out their stance on using sustainability practices. With Classmaids, rest assured that we use all natural non-toxic & biodegradable cleaning products powered by companies such as Seventh Generation. Similar to minimizing your water use – measure cleaning products with sustainability in mind. Don't use more than is needed, which is usually less than you think. Try to use before the best-by date, if applicable. This helps reduce unnecessary waste. Whether using cleaners in a home or in a commercial location, green cleaners help to keep a home or office smelling fresh and free of toxic residue. Surprisingly, green cleaning products are often cheaper than the typical cleaners full of chemicals, and they sometimes require fewer precautions and less cleanup than the other kind. You don't have to worry about residual effects of fumes, powders, or sprays on children or pets. In addition to protecting family and coworkers, you are also helping to take care of the environment. We prefer brands such as Seventh Generation, Method and Mrs. Meyer’s Clean Day. 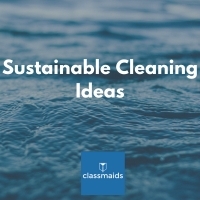 For more information about sustainability related to home or business cleaning and to schedule a cleaning, contact Classmaids: http://www.classmaids.com/contact-us. We care about keeping you, your family, and the world around us clean and safe. Spring cleaning shouldn’t be limited to just your home. 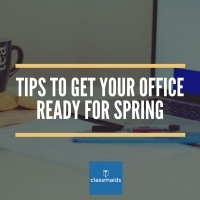 Even if you prefer a cleaning service like Classmaids to handle the bulk of your cleaning, there are some simple things you can do to get your office ready for spring. 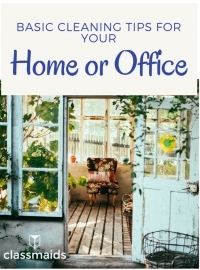 Organizing and rearranging your office can set you up for a great season of success and productivity in your fresh space. Follow our tips for getting your office ready for spring, and let the creativity and new ideas flow! Surfaces such as door handles, faucets, appliances, remote controls, computers, and toilets are all breeding grounds for bacteria because they are touched multiple times per day. During cold and flu season, pay special attention to these areas and wipe them down frequently with your favorite disinfectant. This is the first tip for keeping your home as clean as possible and preventing the germs from spreading from person to person. There are many types of cleaning products on the market, but some contain harsh chemicals that can be damaging to your health. Look for biodegradable products that disinfect without causing dangerous side effects. Biodegradable products are made out of materials that break down quickly and safely without causing harm to humans or the environment, which is why we favor non-toxic brands such as Mrs. Meyers, The 7th Generation and Method. Their bottles are also made from recycled materials and are fully recyclable. Win, win! While it's important to wipe down surfaces during cold and flu season, it's equally important to disinfect shared items in the household. Things like blankets, hand towels, and dishes are all items that need to be cleaned thoroughly when a member of the household is sick. Be sure to wash all bedding at least once a week. Change out hand towels daily, or switch to paper towels when someone is sick. Wash dishes in hot, soapy water, or use the sanitize option on the dishwasher. And remember, Classmaids is always here to help get your home or office clean and germ-free for the cold season! Our trained and experienced cleaning master will arrive at your home with equipment and non-toxic supplies to clean thoroughly and efficiently, leaving your home spotless! For more information and to schedule your Classmaids cleaning, click here: http://www.classmaids.com/contact-us. We understand that each home is unique, so we use the above checklist as a basis, but our clients often customize the checklist to meet their home's specific needs and preferences. Before the cleaning team arrives, we ask that you pick up any personal items and remove any clutter so that more of the team’s energy can be spent on cleaning. It is extremely helpful! Then our trained and experienced team member will arrive at your home with equipment and supplies to clean thoroughly and efficiently, leaving your home spotless! For more information and to book your Classmaids cleaning, click here: http://www.classmaids.com/contact-us. Cleaning a large space, like your home or office, can seem overwhelming, but it doesn't need to be. With these few basic cleaning tips, you can tackle most of the mess with a little time. Start slowly, going room-by-room and determining where the bulk of the mess is. Look at the areas you work most. There are probably distracting items that don't help you focus. Take a few minutes to clear out these spaces. You can either move the items to another location or donate them to charity. Recycle or throw out everything else. Keep in mind that tidying up can go a long way, so start by moving papers and other clutter into stacks or drawers where they belong. This simple act will have a big return – de-cluttering can also clear mental space. This tip goes along with the last one. It's all about maintaining your space before it needs a bigger cleaning by Classmaids cleaning service. If you put away misplaced items and clean up spills and trash for five minutes a day, you'll hardly ever have to take a lot of time to clean. You don't need to buy expensive and harsh chemicals to clean most areas. Basic soap and water will get rid of dirt and grime in no time at all. This is especially true if you use them on a regular basis. Keep a bottle and some rags in a convenient location. Classmaids recommends using only non-toxic biodegradable soaps, which are safe for you and the environment. One of the most frustrating parts of cleaning is that things always get dirty again. Dust will accumulate even in areas of minimal use. Developing a routine will help you stay ahead of the dust and ahead of your list of things and places to clean. Do a little each day – laundry one day, bathrooms one day, the kitchen another day – you get the picture. Need more than basic quick cleaning tips? Let our experienced residential and commercial cleaning crew help. Whether you need housekeeping or a South Florida cleaning service, our friendly and hard-working cleaning team is extensively trained to provide quality cleaning and exceptional customer service. We are licensed, bonded and insured, and we will exceed your standards with our detailed cleaning checklist, our non-toxic biodegradable cleaning products, and much more.